Restringing an Ibanez guitar, or any guitar, is a simple process. Changing your strings frequently will prevent the guitar from losing its clear tone and keep the strings from snapping during use. The new strings will not only sound better after tuning, but will also feel better on your fingers, allowing you to play more comfortably. Unwind the old strings from the tuning pegs. Turn the tuning pegs slowly, so that the strings gradually loosen. Once you've loosened the strings, pull the end of each string out of the peg hole. After removing a string from the peg hole, push the loose end toward the bridge, so that the balled end pokes from the bridge hole. Then, remove the string from the guitar by pulling it through the bridge hole. Clean the guitar as soon as you have removed the old strings. Apply a guitar polish solution to a clean cotton cloth and clean the bridge, pick guard, neck, nut, headstock and tuning pegs. This will remove any dust and grime from the guitar. After cleaning, you may begin restringing your Ibanez guitar. Lay the new strings on a flat, clean surface, in the order in which you will string them. 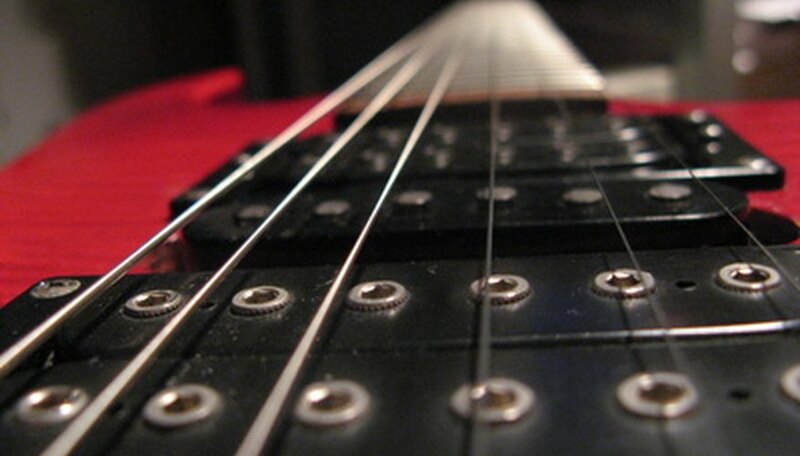 Begin with the low E string (also known as the sixth string), and proceed to the high E string (also known as the first string). Slide the low E string through the top, or sixth, bridge hole, until the balled end rests against the bridge. Slide the other strings through the bridge holes in the same manner. Fit the guitar strings into the small grooves on the nut, to secure them and prepare them for winding. Place one hand over the nut to hold the strings in place, and use the other hand to insert the strings into the peg holes. Allow the strings to remain loose, down the neck, to leave enough string for winding. Once you've inserted all the strings into the proper holes, turn each peg to wind the string and tighten it. Continue until every string is tightly wound. Tune each string with a tuner while tightening it. Once the guitar is in tune, cut the remaining wire from the strings with a wire cutter. Avoid cutting too close to the peg, to prevent the strings from loosening.